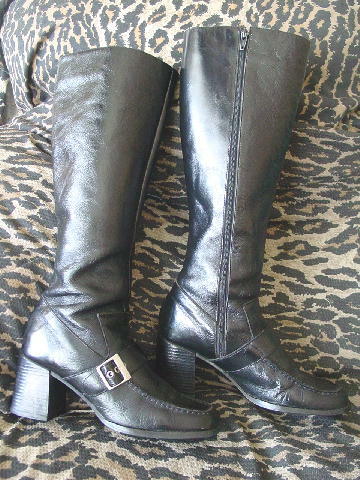 These vintage black leather boots were made in Brazil. They have stacked heels and manmade soles. 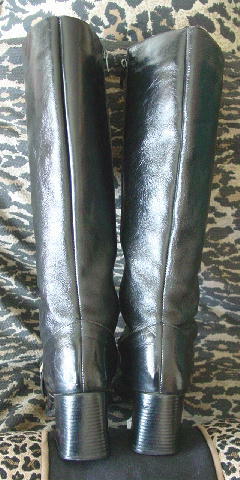 There are inner side top to bottom zippers, wide rounded toes, and a silver-tone buckle and strap across the arch area. 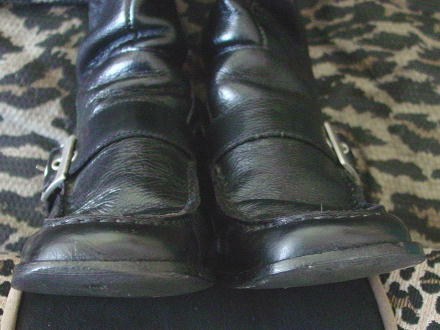 The boots have wrinkles, scuff marks, and scratches. The stacked heels also have surface scratch marks. They have black fabric linings. The heels are worn down more in the back outer sides. A former model wore these all the time to castings and on weekends. She sold them (they've been sitting in her closet) because her feet grew in size over the years. bottom of heel to top of boot 16 3/4"
top inner circumference 13 3/4"